The services that fall under Unified Communications (UC) are quite extensive as this refers to a family of different applications providing integrated communications. Though voice may arguably be the most important feature, other applications falling under the UC classification are sought to supplement communications. Like voice services, hosted UC (also known as Unified Communications as a Service or simply UCaaS), is increasing in popularity for many reasons. In this article we will be taking a deeper look into what is Unified Communications, where it began, the current and future trends, and a look at some Unified Communications companies in the market today. SMS: This abbreviation stands for "Short Message Service" and is commonly used to describe any kind of application that transmits messages as text over a network. Presence and Instant Messaging (IM): The capability to know the availability status of another user is termed "Presence". When a user logs into a communication system, this technology indicates as to whether the user is available or busy. Presence is most commonly combined with Instant Messaging (IM). Once a user establishes presence of another user they can quickly message them in real-time. Call Processing: Various names are used to describe this service (call control, call routing, find me follow me, etc.) but the meaning is the same. In certain environments, software is used to route a call or other form of communication based on availability (e.g. route your desk phone to your cell phone after so many rings, then back to voicemail if not answered). Video Calling: A data stream that sends both audio and video – this technology usually allows multiple users to participate, for example Video Conferencing, and is often coupled with additional features and various controls to adjust display settings and participant interactions. Desktop Sharing: This is another technology that has slight variations to its name though the idea is the same regardless of platform. Such applications allow meeting hosts to share all or part of their screen with other users usually for the sake of working through complex problems. This is often referred to as Web Collaboration or Web Conferencing. Unified Messaging (UM): This is a common term that refers to a sub-family of services including fax, email, text, and voice messaging. The core products each have a respective function but may vary by vendor as different names may be attached to one or more services (think of how 'Skyping' has become synonymous with a video call). Often, these services are grouped in different configurations and may appear to seamlessly work together depending on the presentation of the software suite. Further, certain supplementary features are often added to core services for added value. This has made the market quite broad as different software and providers will apply tweaks to these services or feature the ability to do so for each core product. When the term "Unified Communications" first began circulating during the mid 90s, such applications seemed to be mostly hype. The perception itself is discussable at great lengths but to summarize, this was simply for the fact that software automation and high availability communication was not accessible like it is today. As time progressed, a large number of users began to incorporate applications for personal communication into their daily lives, like the AOL Instant Messenger when it released in 1997 and the MSN Messenger and Yahoo! Messenger applications that followed. Because AOL had a large user base at the time, the technology turned main stream though the capability for real time messaging had existed for some time. Fast forward to today and we see that growth from personal use has trickled into business environments over the past 15 years or so. This led to branching developments such as more formal messaging systems appropriate for business and further created the initiative to tie in other emerging technologies. The business world started to pay more attention to integrated communications as companies accomplished more during the day with the help of speedy, effective communication that positively affected productivity. This influenced a large number of developers to create systems, namely software clients that could be used on workstations so employees could message each other over an internal network. This resulted in less time calling or physically visiting another person each time communication was required. Feedback and "wish lists" turned into real endeavors where companies and private individuals tailored messaging systems to fit into other solutions. Improvements and increased capabilities for technologies such as video recording devices, faxing solutions and email turned into entire UC suites. Though this marked a great stride in communication technology development, it was not without problems. Deployment Issues: Before the open source movement in technology gained a foothold in the world, placing a UC system on a business network could prove problematic. Namely, the cost to "make it work" was often such that the ROI was minimal or non-existent. Functionality Problems: Certain computing environments during the early days were victim to temperamental servers and endpoints. It was common to see users remain logged in when proper shutdown procedures were not followed. Also, business intranets were not nearly as powerful or intelligent as a modern system, producing strange operational anomalies. Accessibility: Businesses spanning multiple locations and employing mobile associates could not take advantage of these systems in some cases. This was a deterrent for large businesses, especially those with facilities in multiple geographic regions. Most of these problems have been resolved to an extent but there are still problems inherent to an internal system. Most businesses have not built systems to be highly accessible and for good reason. Security concerns often limit associates from accessing certain resources from outside the network. This sparked the notion for some to offer hosted Unified Communications solutions (UCaaS) instead of creating server applications and correlating clients for internal installation. By providing a hosted solution, security problems are (mostly) circumvented and accessibility is vastly improved. Today, Unified Communications as a Service (UCaaS) is one of the fastest growing managed services in the cloud communication market. Earlier in 2014 Synergy Research Group released 2013 fourth quarter data that showed an annual growth rate close to 30 percent, and that UCaaS accounted for 8 percent of all managed and hosted business voice subscribers. The growth of these services may be surprising but when considering the benefits of a modern system, these figures fall into place. Reliable security: Most applications are accessible via a web browser or a client that connects securely to its host with either TLS (Transport Layer Security) or tunneling. By removing traffic from an internal system, the chance of a breach drastically falls. Integration of extra services: The ability to easily connect and integrate a company CRM (Customer Resource Manager) or other software is invaluable. Without the capability to utilize data or applications from other services, UC has little appeal. Ease of access: Working remotely is a major benefit of any hosted service. Cloud-based applications are theoretically accessible from virtually any platform making it simple to utilize hosted software from any location. Modular design: Not every component in the UC family is required for all users. The ability to restrict user access to certain areas of the software is good. Even better is the ability to purchase only the needed pieces of a communication suite. Taking cues from other hosted services, one of the greatest benefits lies in the "hands off" approach to configuration, setup, and maintenance. This means that you dont need specialized IT personnel as this is all covered by the provider. Simple secure web based intuitive portals are used for configuration adjustments by the user. The future appears very bright for UCaaS and UC as a whole. There are various reports and data being presented quarterly on the current market size and expected growth. Although the actual dollar value of this market varies across sources, the market value growth forecast between 2013 and 2019 are quite remarkably similar and fall into the 200 percent range. Most sources are predicting a compound annual growth rate (CAGR) in the region of 20 to 30 percent. The majority of this predicted growth is driven by UCaaS. This is understandable when services such as hosted VoIP are considered. Many businesses are becoming more comfortable with such options and aware of the cost savings. Service providers will play an important role in the growth, by continuing to improve integration between applications and introducing new integrated services. Perhaps one of the greatest functions provided by an UCaaS is web conferencing and other video based communications. Virtual meetings boast a multitude of benefits, namely saving the time and expense associated with travel. Coupled with desktop and file sharing capabilities, businesses are implementing these solutions to both lower overhead and improve revenue. Essentially, such services ultimately allow more time to complete other activities when utilized correctly. Many forecasts show the education market as being the biggest adopter over the next 3 years. The education industry now engages students with UC applications such as video conferencing to supplement instruction and in other cases, as an entire model for teaching curriculum. Students and teachers can engage each other virtually such that class time is either supplemented or entirely replaced by web-based instruction. Though some argue that this is a less effective learning model, certain demographics can greatly benefit from lessons otherwise inaccessible. One of the largest and most well-known hosted VoIP providers, Vonage service includes many features and integrations for their solutions. Originally just providing voice as a hosted solution they have added features and integrations to reposition themselves as one of the top business UCaaS providers. Learn more here. One of the highest rated companies in the VoIP market, 8x8 has a large catalogue of services for everything, spanning from the SMB to the large enterprise. Revered by information technology research company Gartner, their UCaaS solutions are considered top notch among others in the industry. You will not find a straightforward price, but you can contact them for a quote as a first step to get you up and running. As a respected company with more than a decade in the industry, their customer base speaks for itself. Aside from their flagship hosted PBX service the company has offered since inception, they have expanded to offer multiple hosted UC solutions. These services can be tailored to meet individual requests based on need. Learn more here. Serving a user base of over 90,000 companies, Nextiva have continued to grow their service offerings, including an impressive list of features such as voice, video, fax, IM, presence, conferencing, plug-ins, and mobility. One of the leaders in networking hardware, Mitel has evolved to offer hosted solutions. Though focused on serving the enterprise, they have products and services to suit businesses of all size in any industry. You can modify available services to accommodate different needs depending on the scope of use. As its name suggests, the idea of Unified Communications is to "unify" all of a businesses communications into one integrated solution. 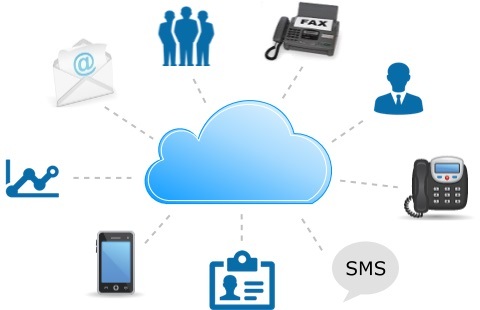 Until recent adoption of cloud-based solutions UC was considered an expensive venture for many small to medium sized businesses. The introduction of UCaaS has changed all of that, allowing any sized business to enjoy the benefits of UC for a low monthly cost, typically based on the number of users. UCaaS has been the main factor for the adoption of UC and the favorable growth forecasts for the next 3-5 years. Even though the future is bright the service providers cannot sit on their laurels. Improvements in integration between applications and addition of other cloud-based services will be required as businesses become more savvy and expectations rise with adoption. Whatever happens, this will be a very interesting market to keep an eye on.